The current Bitcoin slump has hit an even deeper dip in the road in the past day. We've gone over some of the astrological features of the slump in a previous post. So what's with the additional 10% dive today? I think it's Jupiter. Standard astrological thinking tells us that Jupiter can only do good, but I've found no shortage of counter-examples (such as here). For the current Bitcoin price dip, I can only find one "smoking gun": transiting Jupiter quincunx the Bitcoin Sun. There seems to be no obvious news driving the price dip. 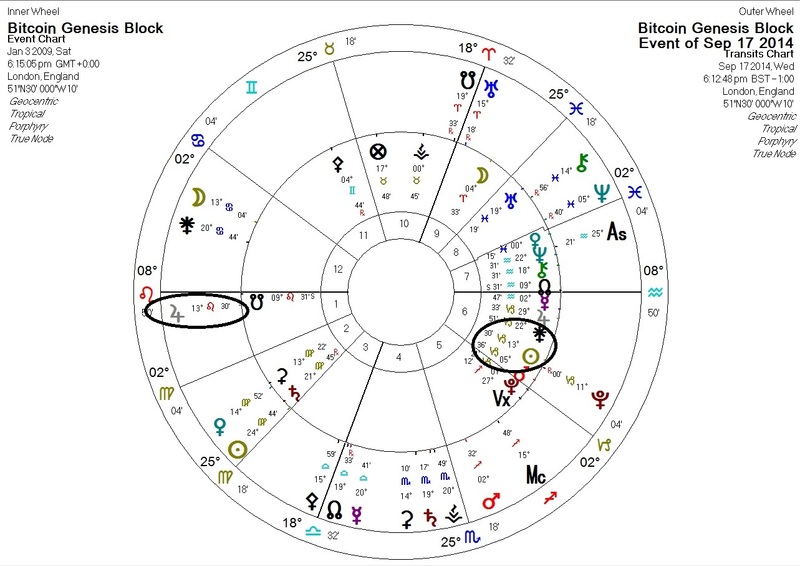 Just Jupiter (perhaps representing some aspect of the public zeitgeist) in an awkward quincunx angle with the Bitcoin Sun. 1. wait for a price dip. 2. check the astrology for a cause. 3. buy if the cause looks like it's a short-term factor. I do the opposite during sudden price spikes, aiming to slowly accrue bitcoins while occasionally taking profits by spending them. So far, it's worked out pretty well.